I have not read what is probably writer Matt Sturges seminal work, Jack of Fables, or his equally popular House of Mystery. I've encountered Sturges's writing just a few times, most notably on the heels of Bill Willingham on Shadowpact, but those few times I've enjoyed myself (Final Crisis Aftermath: Run! being a single exception). 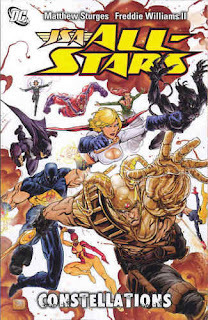 So it was, following up on some continuity notes, watching the last hurrah of some favorite characters, and also in a conscious attempt to read more of Sturges's work, I came to JSA All-Stars: Constellations. The second opportunity afforded to me by Constellations was to study Freddie Williams's artwork further. I liked Williams's art on Robin, but was less satisfied with the more cartoony aspects in the aforementioned Final Crisis Aftermath: Run! (Sturges and Williams re-teaming on JSA All-Stars was one reason I was slow to pick up this book, until interest in a variety of characters brought me in). Since Run!, I have struggled to enjoy Williams's art again -- "Why should I like it?" I ask, and DC Comics replies, "He draws it all digital!" "Yes," I repeat, "but why should I like it?" 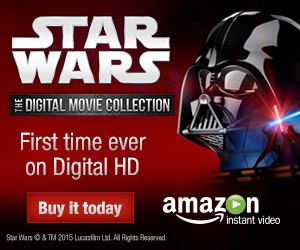 "It's digital!" OK, I think; maybe there's something to that. With an open mind but some trepidation, I ventured in to JSA All-Stars. I had not been in favor of the Justice Society team splitting nor DC publishing two JSA books. I didn't think the market would support it (and indeed JSA All-Stars was later cancelled, the final issues uncollected). The split essentially separated into two titles the "stodgier" (forgive me) and "hipper" parts of the Society, a combination I thought necessary to make the initial book work; the "hipper" characters, whom I'd prefer to read about, were under a creative team I disfavored; the "stodgier" characters, whom I found more interesting, were under the creative team I was more likely to try. I maintain that the Justice Society franchise is poorer for this split; I have liked a number of the Justice Society books since then, including Axis of Evil and Supertown, but not so much as I liked the original books by Geoff Johns. But a few pages in to the second chapter of Constellations, it clicked for me where the JSA All-Stars title fit in the overall DC Universe, and this largely informed my enjoyment of the book. There is, indeed, some precedent for all of this. Though the two teams did not exist in the same time period, there was a time when All-Star Squadron presented the adventures of the classic Justice Society, while another title offered the "hipper" exploits of the Society's descendents. When Stargirl Courtney Whitmore talks about missing the JSAers on the other team, and Hourman Rick Tyler commiserates that he, too, misses his old teammates, I realized: "All-Stars," nothing; this is a new incarnation of Tyler's old team, Infinity, Inc. In that mindset, that All-Stars is not some lesser, substitute version of my favored Justice Society, but rather a young team of legacy heroes a la Infinity Inc., I found I could let go of my expectations and enjoy the story. And Sturges makes this easy. Constellations quickly fills up with my favorite aspects of Justice Society -- Power Girl as team leader, former JSA chairman Sand and Infinity, Inc.-er Atom Smasher nee Nuklon gain membership, and the Injustice Society shows up (even as I decried their ubiquity the other day in my Supertown review, Sturges uses the Injustice Society's appearance to pick up on elements from one of my favorite JSA stories, Stealing Thunder). I can even forgive some of the annoying bickering between characters Tomcat, Damage, and others as "youthful enthusiasm," given that this is not Justice Society but rather Justice Society by way of Teen Titans (or rather, by way of some of the better "twentysomething" teams of the past couple decades, like Devin Grayson's Titans or Judd Winick's Outsiders). As a story in which the JSA All-Stars fight the Injustice Society, Johnny Sorrow, and the King of Tears, Justice Society fans might be justified in stating they've seen it all before. But I felt Sturges successfully channeled the tone of the best of Geoff Johns's work on the original JSA in a number of the cutaway scenes with Sand and Atom Smasher, and in Sorrow's secret scheme revealed in the final pages. I also adored the conflicts of leadership between Power Girl and Magog and their differing philosophies of battle (and capital punishment). It's a shame that Magog has to exit the title early on; I did note the similarity between Magog chiding Power Girl for saving the life of one villain, even if that villain would kill hundreds later, and new character Anna Fortune warning Power Girl that if Fortune used a spell to save the single life of King Chimera then, she couldn't use the spell to save hundreds later. Sturges seems to set up Power Girl to have to justify her "needs of one outweigh needs of many" philosophy later on down the road, and I'm hopeful he can get to it before cancellation and cancelled collections end the book. In the end, if I thought JSA All-Stars: Constellations would be silly, campy, irreverent, or gratuitously violent (all attributes I'd ascribe to Final Crisis Aftermath: Run! ), it was none of these things. I finished the book quite pleased with Matt Sturges's writing and interested to read the next book in the series. I can't claim, however, to feel much more comfortable about Freddie Williams's art than I did before. I did not dislike it as much as I did in Run! ; as I noted in my review of Run!, Williams likely tries to achieve some ugliness and distortion in that book befitting the tone of the story, that he did not in Constellations. His depiction of Power Girl, talking to Sand in the sixth issue, is downright pretty, and his supernatural Anna Fortune resembles the best costume design of Humberto Ramos. I can even forgive some distorted figures as "stylistic" (see Stargirl with pointy noggin on page three); I'm a long-time Duncan Rouleau fan, and you hardly find figures more distorted than his.. But much as I studied Williams's sketchbook at the end of the book, I couldn't quite see what advantage his digital art brought to the page; it's quite interesting, for instance, that Williams creates digital "sets" for the book's various locations, but I didn't see many unusual perspectives or panels come out of it. Perhaps when considering "digital art," I'm imagining something more like Brainiac-13 from the "Superman Y2K" storyline (Superman: Endgame); if I didn't know Williams's art was completed on computer, I'd never think so. To that end, while I can deal with a little distortion, I was disappointed by Williams re-using the same panel three times in the third chapter, or Power Girl's costume losing a certain famous element for a part of the same chapter. Williams's work in Constellations improves my previous opinion of his art, but does not necessarily make me a fan. All in all, however, JSA All-Stars: Constellations came as a pleasant surprise, and writer Matt Sturges has much to be proud of; more's the pity that, so far, he seems to have found no place in the DC New 52. The next book, Glory Days, is the one that really has my interest, as it deals with the death of a team member and one of my favorite characters. We'll have that review here some time coming up. Barring any breaking news, this is the last Collected Editions review for 2011. Come Monday, we'll have a special guest review by Wayne Brooks, whose take on Aquaman: Death of the Prince you enjoyed; and then at the end of the week, the Collected Editions review of the long-awaited Chase collection, including all of Dan Curtis Johnson and J.H. Williams's issues, back-up stories, and more. Happy new year, and see you soon! I'm just now reading Geoff Johns' JSA for the first time so it'll be a while before I get to this one but I'm already a big fan of the team and I agree that I like the mix of the old guard and the young kids.